Want to Be Successful at Sales? Then Change your Mindset. I think one of the reasons I hear those things is because of the perception of the profession of selling. Consider this… when I say the word, ‘salesman,’ what sorts of images comes to mind for you? The stereotypical used-car salesman? That guy near Disneyworld selling time shares? 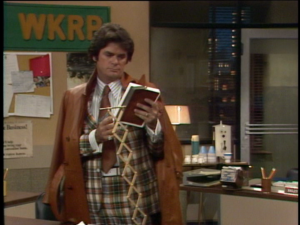 Or (for those of you in my generation) maybe Herb Tarlek, the radio ad salesman from the late 70’s sitcom, WKRP in Cincinnati? I get it. No one really wants to associate with “salespeople” like that. Your physician is talking you through the pros and cons of a delicate procedure she thinks you need. Your financial advisor is discussing ways to best invest that small inheritance left to you by your grand-dad. Make no mistake about it… the doctor and the advisor are both selling, but their approach is 180 degrees from Herb Tarlek. Instead of trying to ‘force’ you to buy something they want to sell, the doctor and advisor are working with you to help you make a smart, informed buying decision. They’re not seen as salesmen… they’re seen as trusted advisors – helping, not selling. And it’s that same mindset you need to employ in our industry. Rather than pitch a sales prospect on everything you have to sell, work with them to understand their needs, their challenges and their goals. Ask a lot of questions. And then ask some more. Really get to understand their business. Only then can you recommend an appropriate solution. And guess what? Sometimes – after really getting to know the sales prospect – you’ll discover that you and your firm are NOT the best solution to their current problem. When that happens, refer them to other reputable vendors that are a better fit. Do that… and your honesty and focus on their needs (not yours) will elevate you to a level of trust and credibility that will pay huge dividends down the road. Take that mindset into the marketplace… and the new business opportunities will come.